The Cessna Citation M2 is a business / private jet that is a part of the light jet category. Two Williams International FJ44-1AP turbofan engines provide propulsion for the Citation M2. On September 26th, 2011 Cessna launched the Citation M2 aircraft program. When it was launched it seemed to be a totally new jet. The aircraft is actually not a new clean sheet designed aircraft, as the aircraft is actually a continuation of the Cessna Citation CJ1 program. Cessna continued the Citation CJ1 and CJ1+ programs with the Citation M2. The CJ1 brand has been retired for new aircraft, with the M2 brand taking its place. FlyRadius is unsure why they changed the name, however it seems that M2 may stand for the "Mustang 2" or the next biggest jet it Cessna's lineup. The aircraft does have a totally redesigned interior and avionics system, when compared to the CJ1. On March 9th, 2012 the Cessna Citation M2 completed its first flight at the Mid-Continent Airport Wichita, Kansas USA (KICT / ICT). The first production Cessna Citation M2 made its first flight on August 23rd, 2013 at the Independence, Kansas airport (KIDP / IDP). Then on December 23rd, 2013, the Citation M2 received Federal Aviation Administration certification under part 23. 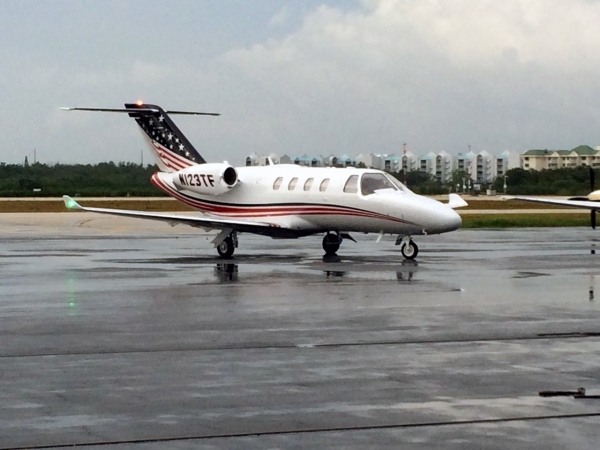 On the same day Cessna delivered the first Citation M2 to Stuart Woods LLC as N123TF, aircraft serial number 525-801. Cessna aircraft serial number 525-800 is the test / prototype Citation M2. The FAA gave it an airworthiness certificate on December 22nd, 2013, making this the actual type certification date. Cessna gained European Aviation Safety Agency (EASA) certification on June 23, 2014, a significant time after FAA type certification (6 months). All Cessna Citation M2s are certified under the same type certificate that Cessna uses for its CJ (Citation Jet) lineup. The M2 is designated as the Cessna 525, which is the CJ1's model number. More information on the Cessna Citation M2 will be posted shortly on the site. Above Cessna Citation M2 photo of the first aircraft by Jordan Sangerman on Wikimedia Commons. Modified by FlyRadius. Photo released under a Creative Commons License.